The illustrations below assume you have the data history installed along the default installation path. 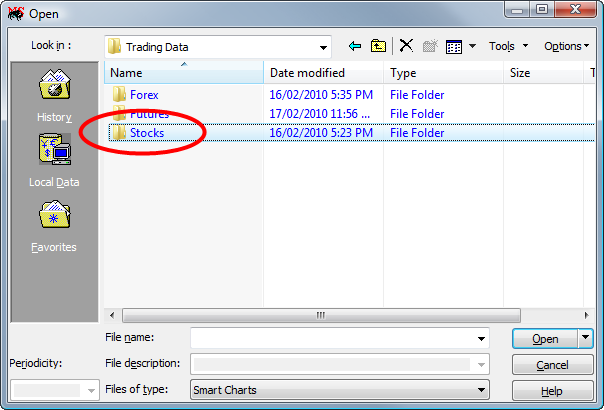 If you have the "Stocks" folder installed along a different path, please take that into account. Now - let's see how to open the ASX stock "BHP Billiton" (BHP). 1. In MetaStock™, click File > Open. 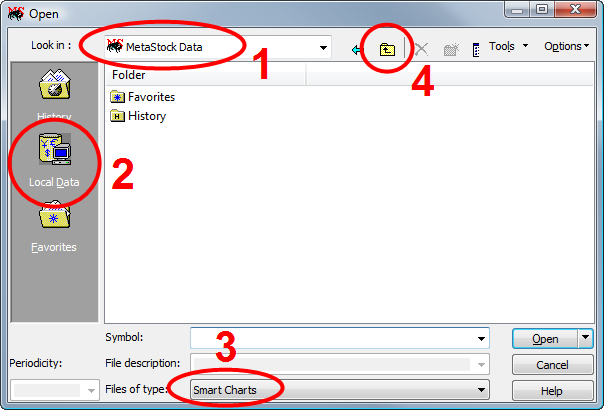 The "Look in" edit box at the top (see  in the illustration below) will show the current folder (in this case, the folder that holds the sample data that comes with MetaStock™). Select "Local Data" on the left  and Files of Type = Smart Charts at the bottom . 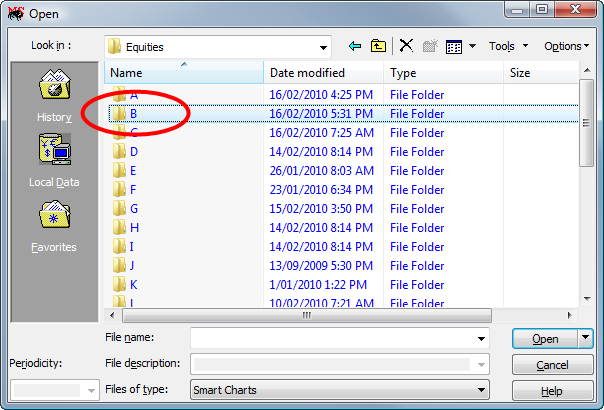 Then click the up arrow  to start navigating through the drive/folder structure of your machine to get to our "Trading Data" folder. 2. 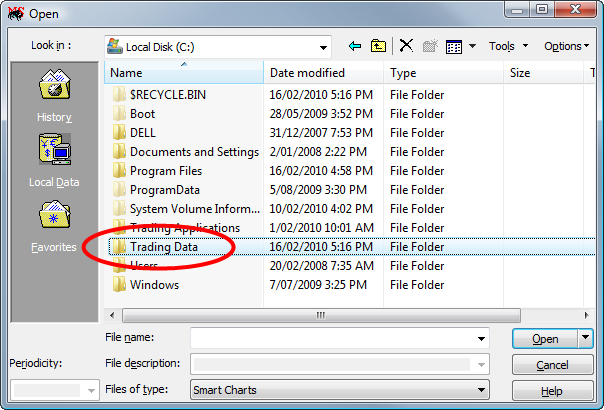 Once you can see the "Trading Data" folder in the window, double-click on it. 3. Now you should see the "Stocks" folder. Double-click on it. 4. Now you should see the "ASX" folder. Double-click on it. 5. Now you should see the "Equities" folder. Double-click on it. 6. Now you should see the "B" folder. Double-click on it. 7. Now you should see a list of stocks. 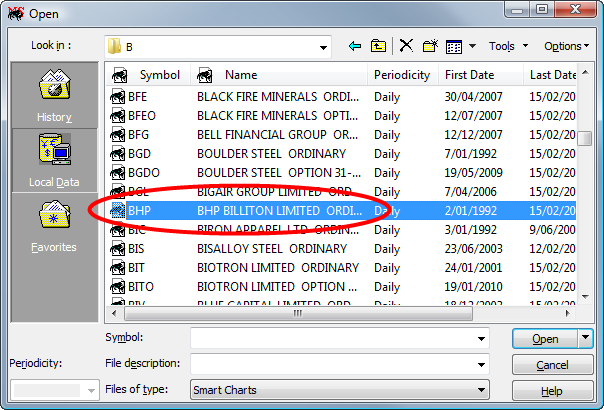 Look down the list for the symbol "BHP" and double-click on it to open that file as a Smart Chart. MetaStock is a registered trademark of Equis International, Inc.